Zoning ordinances are usually written by zoning commissions on behalf of counties or municipalities, based on a master plan for how they anticipate or want their community to grow. For example, a large, generally flat, open area with good interstate access at the edge of a community might be zoned industrial, as it could easily be developed into manufacturing or warehouse-type facilities. By contrast, an inside lot in a single-family subdivision would likely be classified in some sort of residential zone. The idea behind the concept of zoning is to keep like uses of properties in similar areas. For example, zoning regulations often prevent construction of a factory next to your home without some sort of buffer zone. In this way, zoning can protect property owners from adjacent land uses that could adversely affect the value of their own property. When valuing a property, zoning is an important factor that must be considered. As appraisers, we are familiar with the zoning regulations in all of the communities that we work in, and have extensive knowledge of the regulations in place for each of the districts within those municipalities. 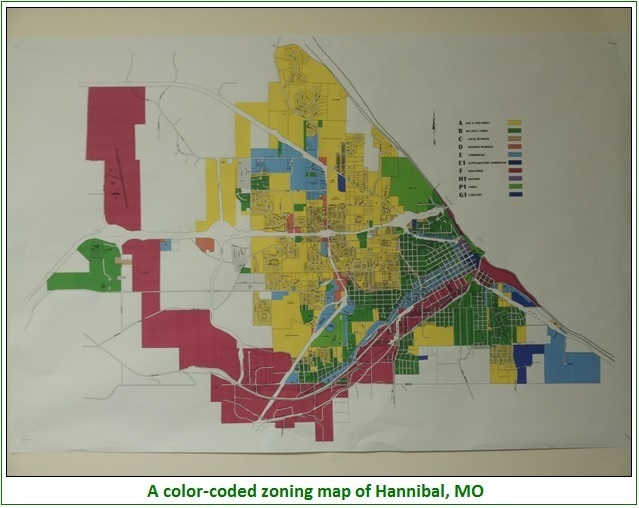 This is important due to the differing criteria for zoning districts. Some communities call the residential district R-1, and allow 1-4 family dwellings with few restrictions, while R-1 in another community may only allow single-family residences and require a lot area of at least 20,000 square feet. Due to this differing criteria, an appraiser must give careful attention to zoning regulations. By contrast, we have seen other appraisers who merely note the district that the subject property lies in, without giving any description of the requirements for that district or any explanation of the zoning of comparable sales or explanation of any adjustments or lack thereof. It is also worth noting that not all cities or counties actually have codified zoning ordinances—like Houston, Texas, the most well-known and largest US city without zoning. This occasional indifference to zoning is partially due to the problems it can cause. Many of the problems commonly associated with zoning come as decades pass from the original master plan that the zoning is based on. People’s desires change, and as such, the market tries to adapt, and zoning codes often become outdated. In response to this problem, property can usually be re-zoned, or a “variance” may be obtained to construct a non-conforming structure. Because each municipality develops its own zoning code, each one is different, and obtaining a variance or approval for rezoning can be much easier or harder depending on the municipality and the procedures that must be followed. As such, re-zoning is often both a long and costly process that can take several years or more, or may be denied altogether. If you are applying or considering applying for a change in zoning, an appraiser’s professional analysis can be a valuable tool to present to the zoning commission or city council. Spurgeon Appraisals can complete a market study, or do an appraisal to determine the change in market value that results from the change in zoning, or to determine the extent to which other neighboring properties might be affected. As always, we do not shy away from projects other appraisers are hesitant to accept.